Label, mark, and structure a variety of materials with extreme precision using nanosecond fiber lasers. The JenLas® fiber ns 25-105 laser product family opens up a wealth of possibilities for laser material processing applications: the pulsed nanosecond fiber lasers are suitable for labeling, marking, and cutting different materials, as well as for structuring your surface exactly. They create laser marks on metals or plastics, for example, while extremely thin layers can be removed precisely. The JenLas® fiber ns product family is available in 25, 35, 55, and 105 watt power categories. They are based on reliable, industry-tested fiber laser technology. Features include; air-cooled, pulse duration settings ranging from 190 to 250 nanoseconds, and peak pulse powers of up to 8 kilowatts. The lasers’ immunity to back reflections has seen significant improvement through optical isolators, which are built-in as standard. 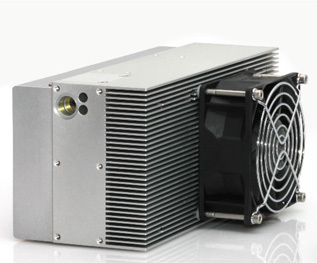 The lasers are specially designed for OEM integration into an industrial plant, but can also operate separately as modules. They are controlled entirely by interface commands or TTL signals. In addition, mixed control methods are possible, significantly simplifying fast commissioning and integration into existing industrial plant. All power is via an industry-standard 24 V supply voltage. In addition, we can also provide directly adaptable collimator modules for different beam diameters, as well as a wide range of accessories for optical beam guidance systems in the form of variable beam expanders, F-theta lenses, telecentric lenses – through to entire optical subsystems for integration into machinery. We offer certified add-on modules that allow laser sources to be turned off safely in accordance with industry standards. Plus, we can assist you with integrating laser sources into your laser processing plant; we also undertake feasibility studies in our laser application lab.